Another summer is soon coming to a close and once again, I haven’t had a chance to write on my blog. Amish tours have been keeping us busy everyday in August. I did get a chance to sneak away on vacation with the family. Thanks to Eric and Vern for their guiding expertise while we were away. Our family had a wonderful time in SD, NE, WY, MT, ND, and MN. Lots of driving, but well worth it! Now is a great time to go on an Amish tour as the Amish are working in their fields binding corn, chopping and blowing it into their silos. The also can be found loading alfalfa and baling it right in their farmyards. All of this is done with stationary diesel or gas engines and horse drawn equipment, no tractors. 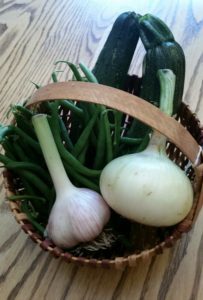 Many Amish have garden produce available for purchase at their farms. Melons, potatoes, tomatoes, zucchini, and cucumbers are a few veggies from their garden they have for sale. Amish ladies have been canning bushels of tomatoes, tomato juice, and tomato salsa. The peaches have been canned and now I have seen that pears have arrived and they will be next on the list to preserve. One Amish lady on our tour has finished two new quilts–dahlia and lone star patterns. She also takes custom orders for quilts as well. She pieces the quilts with her treadle sewing machine and hand stitches the top. They really are a work of art. Enjoy the end of summer! Soon the kids will be back in school and our schedules will revolve around school activies as well as work. Gardens, gardens, gardens!!! The Amish gardens are big, beautiful and bountiful. Strawberries are ready and available for sale at some of the Amish farms on our tours. I’ve had my share of berries from a couple Amish families this week. 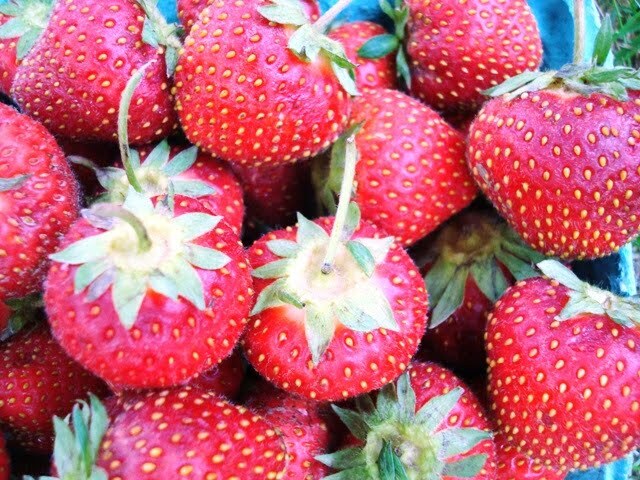 The strawberries are plump and sweet! Kirsten and I are hoping to use our new dehydrator this week to make strawberry rhubarb lace–like a fruit roll-up. Fresh picked vegetables that are for sale include peas, green beans, and lettuce. One family gave me a bunch of broccoli this week. I prepared the broccoli on our grill for dinner tonight and it was delicious! The Amish are back working in their fields after many days of rain. They have been cultivating corn and mowing hay with their team of work horses. I think it is amazing to watch them drive their team between the rows of corn. I had a fellow on the tour that had grown up farming with horses and he remembered the hard work involved. My dad has many stories to tell about farming with horses as well. Maybe that is why I’m fascinated with watching them–I haven’t had to work with the horses! Happy Father’s Day to my dad and all dads!